UAE's Etihad Airways and Gulf Air, the national airline of Bahrain, have signed a codeshare partnership. The agreement will see Etihad place its ‘EY’ code on Gulf Air flights from Bahrain to and from Abu Dhabi, Baghdad, Casablanca, Dhaka, Faisalabad, Larnaca, Malaga, Multan, Najaf, Peshawar, Sialkot and Tbilisi. 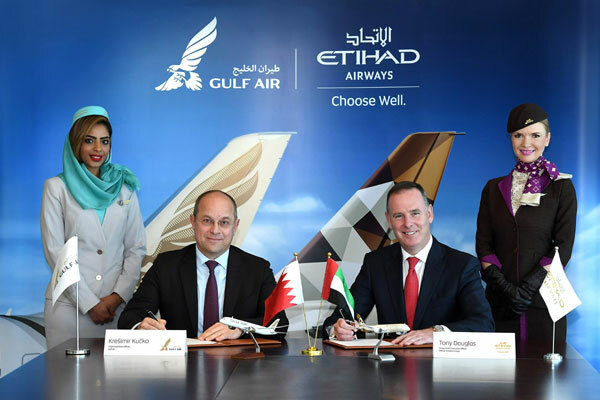 In addition to the codeshare signing, both Etihad Guest and Gulf Air Falconflyer loyalty programmes are exploring ways to offer earn and burn opportunities.